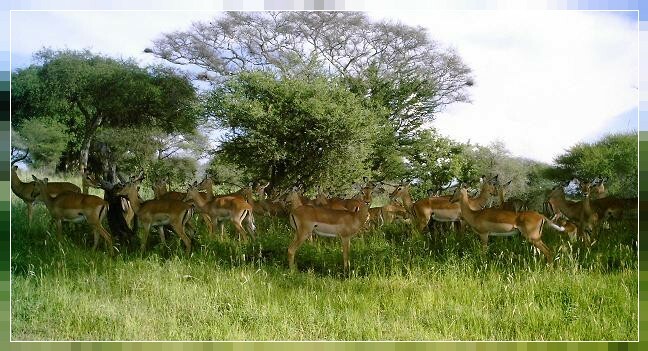 The park is half way up Lake Tanganyika and below Gombe Stream National Park. It was created to protect 1,000's of chimpanzees and is set in the Mahale mountains which are stunning. It is reknowned for fantastic sunsets over Lake Tanganyika and Eastern Zaire which makes it an essential stop for the keen photographer. The habitat combines rain forest, grasslands, alpine bamboo and woodland. The best time to visit is between May and October. Climbing; snorkelling to observe the 90 species of cichlid and other fish in Lake Tanganyika; photography; walking safaris. 50 species of animal have been noted in the park predominantly from the monkey family: chimpanzees, yellow baboon, Sykes monkeys, red tailed, savannah, colobus monkeys (both red and black & white) and 2 species of galago.